Canterbury secured a place in the National Two play-off as the City Men made it 11 wins in a row against Barnes. Andy Pratt’s side produced a fine comeback in the capital to clinch the necessary bonus-point win to set-up an historic clash with Chester at the beginning of May. Canterbury could join newly crowned champions Rams in National One next term and the Berkshire club beat Birmingham and Solihull in Round 29, which confirmed the Bees’ relegation to the fifth tier. Pete Glackin’s side battled well at Old Bath Road, but they were unable to get the desired result to take their survival bid to the final day. With the Midlands club losing out to the Rams, it meant Worthing Raiders, Old Redcliffians and Dings Crusaders all secured their safety in this division. Worthing actually beat Dings in Bristol while Old Reds produced an excellent display against Redruth, but all three sides will now be plying their trade in National Two South next season. Elsewhere in the division, Tonbridge Juddians, Henley Hawks, Taunton Titans and Bury St Edmunds all sealed comfortable wins. Birmingham and Solihull have been relegated from National Two South despite a spirited display against newly crowned champions Rams RFC. The Rams led from the sixth minute, but they were challenged by the Bees until Jak Rossiter’s late score at Old Bath Road. Jack Steadman, Rossiter, Andrew Denham and Tom Vooght all crossed to give the hosts a 26-7 lead at the break, with Birmingham and Solihull’s points coming via a penalty try. James Page continued Rams’ dominance after the restart, but the Bees fought back as Zane Raimondi, Corey Venus and Dan Kelly crossed to make it 33-24 with 10 minutes left. However, the Midlands club couldn’t find another way through and their one-year stint in National Two South has now come to an end. Canterbury have booked their place in the National Two play-off, but they had to come from behind to seal a win at Barnes. The City Men will take on Chester at the Marine Travel Ground on May 4th, but Andy Pratt’s side had to battle back to secure the all-important bonus-point victory. Canterbury Rugby Club host Chester RUFC for the playoff to see who is promoted to National 1. Alex Hind and Jack Garrett both went over for the hosts to help Barnes into a 12-5 lead, with Sam Sterling crossing for Canterbury. A penalty from Tom O’Toole kept the home side in the ascendency after half-time, but Canterbury clicked into gear in the second 40 as a penalty try was swiftly followed by a James Stephens score to put the visitors in front. Sterling’s second and a try from Ricky Mackintosh completed the job for Canterbury, while Rob Malaney’s late effort was merely a consolation for Barnes. Tonbridge Juddians romped to a comfortable victory over Clifton to stretch their winning run to 12 matches in National Two South. Peter Dankert’s side ran in nine tries, but their hopes of sneaking into the play-off spot are over after Canterbury’s bonus-point win at Barnes. Hugo Watson scored a hat-trick, while Ben Ashmore, Tom Chapman (2), Tom Nicoll (2) and Duncan Tout also crossed. Clifton scored tries through Tom Stanton and Niall Gibbons, but this was a tough afternoon for the Lavender and Blacks. Henley Hawks ran in eight tries as Nigel Dudding’s side continued their recent ruthlessness against Old Albanian. The Hawks have now racked up 162 points from their last three games and the men from Dry Leas scored four tries in the opening half at Woollams to lead 31-0. The visitors went over for try number five shortly after the interval, but OA’s responded with two tries of their own; one coming from Alex Charlcraft. However, Henley crossed on two more occasions before the final whistle, while OAs’ third score was merely a consolation. Taunton Titans thrashed Guernsey to finish in fifth place in National Two South this season. Tries from Chris Francis and Matt Jess gave Taunton a 12-5 lead at the break, but only after Guernsey’s Jason Batiste had opened the scoring. Lewis Webb and Connor Baker both crossed to put Taunton in control while Francis, Sam Prior, Connor Banks and Freddie Fraser added further tries for the visitors. Cameron Craine and Dale Martin replied for Guernsey, but they were simply outclassed by the Titans. Will Scholes and Finlay Sharp both scored twice as Bury St Edmunds strolled to a comfortable victory over London Irish Wild Geese. It was all one-way traffic in the opening half with Bury leading 36-0 helped by tries from Scholes, Jaid Wiltshire, Sharp, Alex Grey, Oliver Watson and Levi Roper. Sharp, Scholes and Aaron Forrest crossed the try-line in the second period as Bury waltzed to a victory in Suffolk. London Irish Wild Geese scored their only try of the game through Paul O’Dell on 70 minutes. Old Redcliffians confirmed their safety in National Two South in style as they produced a sparkling display to beat Redruth. Before the start of play on Saturday, Saul Nelson’s side were eight points clear of the bottom three, but they went on to secure their crucial victory in style at Scotland Lane. Ezra Caven scored a first-half hat-trick for Old Reds and James Clements got in on the act to put the hosts 29-7 up at half-time. Tom Notman had scored for Redruth in the opening period, but Old Reds continued their dominance as Henry Bird and Kieran Ward both grabbed doubles while Jack Simmons, Notman and Dean Bonds salvaged a bonus-point for the away side. Dings Crusaders have avoided relegation from National Two South, despite losing to Worthing Raiders who also confirmed their safety in Bristol. 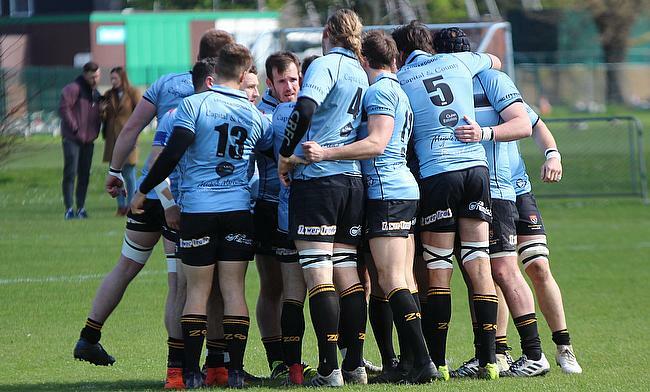 Both sides were still battling for survival heading into Round 29, but with Birmingham and Solihull losing to Rams RFC, it means Dings and Worthing will now be plying their trade in the fourth-tier next season. Jack Maslan scored the decisive try in the final five minutes to clinch a second win on the spin for Worthing in an entertaining contest. Dings were awarded a penalty try and scores from Jordan Grattan, Michele Canulli and Josh Trinham put the Crusaders 26-7 up, after Curtis Barnes had initially given Worthing the lead. Jack Forrest scored on the stroke of half-time to keep the Raiders in the contest but his second try, combined with John Dawe’s effort, put Worthing in front. Tom Anderson then went over for Dings to give them the advantage once again, but Maslan darted into the corner to seal the victory for Worthing.